Many of us eat this delectable spice in one way or another every day. But, how many of us actually know the rich history of cacao and the alchemy of creating the bliss that hits our tongues and makes our hearts fill with warmth? Cacao goes all the way back to the early Mesopotamian civilizations where they first started cultivating and creating the divine food that is: chocolate. It is said that the Olmecs of Southern Mexico were the first to use cacao beans. They were the first to ferment, roast, and grind them for drinks. Many of us think of the creamy texture of chocolate, but in the raw, a cacao bean is a pod-shaped seed about the size of an American football, inside the pod is the tangy-sweet seed that is pulled from a gummy white flesh lining. Cacao seeds are bitter in their natural state and will most likely not be recognizable to many people. How did the Olmecs know then to dry it, ferment it, and roast it? It is said that someone was eating the fruit, and spitting the seeds into the fire, and the rich smell of the roasting inspired the thought that maybe there was something more they could do. The natural bitter flavor of cacao came through at full strength in early Mayan recipes and it was rarely combined with sweetener. Something very different to the chocolate that is produced now. However, they used a variety of herbs and spices to flavor the cacao such as cayenne and vanilla. Cacao was sacred during this time and to this day, you find people that grow chocolate as a family tradition and cultural practice. They use to be associated with high status and special occasions. They were used for initiation rites for young men and celebrations marking the end of the Mayan calendar year. Later, cacao was used to seal marriages and was used in mythological scenes. When they had to communicate to the gods related to nature, rain, and fertility of the earth, they pulled out cacao and began drinking. They were used as offerings to the gods related to nature. They were used as a currency and even used as a medicine. Cacao grew from a ceremonial and extensive practice. It was sacred. It was respected. Sadly, a lot of the chocolate we have now does not follow in this path, but Loving Earth is one company that does. 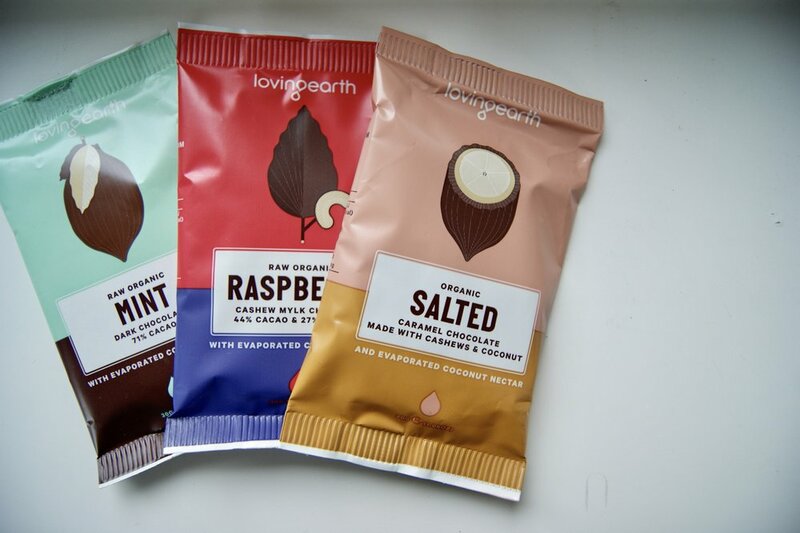 If you have not heard of the Loving Earth company, I highly recommend reading about their story and how they started making chocolate. It’s truly beautiful. The founders, Scott and Martha journeyed to Mexico, working with an indigenous Mayan co-operative to help them find a market for their coffee and cacao. It started to become apparent that the only real asset many of these communities had in the modern world were the crops that their ancestors had domesticated. It was the Olmecs, the ancestors of the Mayan cooperative that Scott was working with in Izapa, who first domesticated cacao thousands of years ago. With Loving Earth being based in Australia, it makes it difficult to get in places like where I live currently, Estonia. HOWEVER, thanks to a wonderful company here in Estonia called Biokarma, I was able to try some of their yummy products AND because of them, a lot of their products are available in stores here in Estonia and online on their website. Biokarma sells basic staples such as your favorite asian products to things you can’t find in every store like camu camu powder, siberian pine nuts, and so much more. Many of their products are even organic. Biokarma is a place that brings health and mother nature together. I love Biokarma’s philosophy about “we are what we eat.” In a world that is forgetting the true meaning of real food, Biokarma is a breath of fresh air. I first tried the “Paleo Mix” which is grain-free and filled with an assortment of nuts and seeds. Nuts can be a bit boring sometimes, but this was divine. I love that is was not sweetened, but still had a delightful crunch. I felt it would make the perfect smoothie bowl topper. Smoothies are already sweet, but it’s nice to have that crunch on top and this paleo mix was the perfect fit. You got a creamy sweetness from the smoothie and a vibrant crunch from the mix. I love that this mix has brazil nuts in it, they are filled with selenium which many of us are deficient in, but did you know two brazil nuts a day will give you all the selenium you need? Nature is amazing. I next tried the “Berry and Cacao” cereal. Loving Earth’s products are based on ‘buckinis’ which was something they termed for buckwheat. Cool, isn’t it? This mix was a combination of buckwheat, goji berries, cacao nibs, and other seeds. It is sweetened with coconut nectar and apple juice which gives it the perfect slight sweetness. I paired it with some coconut yogurt, frozen blueberries, and a generous scoop of crunchy peanut butter. It was wildly delicious. The sweet coconut yogurt balanced so well with the buckwheat. Super crunchy and full of flavor. The frozen berries went well with the tart dried goji berries in the mix. Now, THIS was probably one of the best things I have ever eaten and that is an understatement. The last of the buckinis was the ‘chocolate clusters’ and WOW, you can really taste the quality of the cacao. A rich flavor with just the right amount of sweetness that could be used as a dessert, but not to sweet that you couldn’t have it for breakfast. Again, super crunchy and I love the addition of currants in the mix. It balances the crunch with a soft sweet bite intertwined with the decadent chocolatey bliss. I decided to make a chia pudding as the base and in the morning I layered the pudding with the chocolate clusters and homemade applesauce. I am writing this as I eat this wonderful creation and can I say, I already want another one? The final products were the Loving Earth chocolates. As someone who has tried her fair share of good quality chocolates, these were absolutely divine. I started with the mint because dark chocolate and mint are one of my favorite combinations. I took one bite and my lips curved into a smile. The mint flavor radiated throughout my tastebuds in all the best ways possible. They used peppermint oil rather than extract and the difference is earth-shattering. Yes, you read that right. Earth-shattering. Sometimes extracts can taste artificial, but using the oil brings such an authentic and warming flavor. Truly. I next tried the salted caramel and it was everything I hoped it would be. It was rich, creamy, and wonderfully sweet because sometimes we need that extra sweet punch. It reminded me of dulce de leche, which if you haven’t tried that, it is a Spanish dessert that is comprised of condensed milk and sugar and is cooked for a long time until its thick and caramelized. That’s what that chocolate tastes like to me, who doesn’t want some now? Lastly, I tried the raspberry and to be honest I did not really know what to expect since I do not tend to buy berry flavored chocolate. I took a bite and I just tasted the chocolate, but after a few seconds, the berry flavor came through. It was just a hint of delicate raspberry and balanced well with the cacao flavor. Some chocolates with berry flavors tend to be overpowering and artificial, but this tasted like it took a quick bath in pure raspberry juice. Mmmmm. Now, after reading all this, I’m sure you are all craving some chocolate, head over to Biokarma and treat yourself. You won’t regret it.